Moveable – Wearable Art. 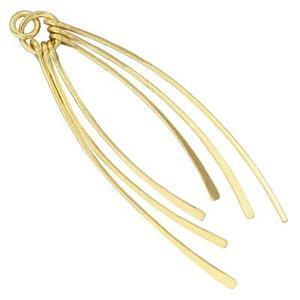 Our SG6525 – Gold-Plated Sterling Silver Curved Fringe Tassel. Our photo does not do these tassels justice. When hanging the individual fringes move in and cross each other about three-quarters of the way down and form a unique, almost Art Nouveau design. Instant earrings! I adore these!! I would buy these in sterling and rose gold plate if they were available! !